Description: This journal will brighten your day with colour the 96 sheets of lined off-white paper. Available in 6 colours. Features: Features bright coloured edges with corresponding coloured elastic closure. 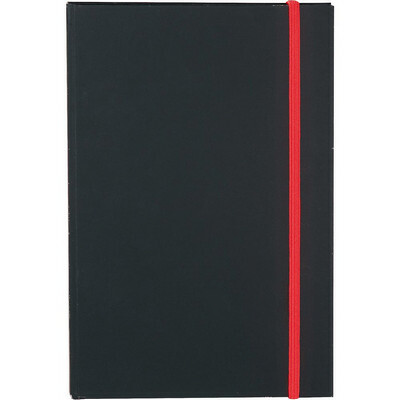 Soft matte black cover highlights the most subtle or colourful logos. Packaging: Polybag. Colour: Black + Red Material: Ultrahyde Product Size: 213mm(h) x 145mm(w) x 14mm(d). Freight details: 36 per carton, 12.5kgs, 33 x 25 x 29cms; Decoration Type(s): Colour Print / Deboss / Debossed Foil / Foil Stamp / Full Colour Print . Decoration Area: Pad/Screen: 150mm(h) x 85mm(w). See drop down menu for decoration options.